A decade of magazines. PHOTO: Tim McSorley. 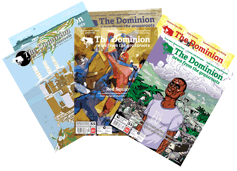 From Nova Scotia to British Columbia, from a photocopied zine to a printed magazine distributed on newsstands across Canada, The Dominion has changed a lot over the past decade. But we've kept doing what's most important to our readers across the country: putting out news and analysis that breaks with the status quo. Choosing ten stories from ten years is an absurd task, and our list of favourites was long. What you see below are a few picks from our editors, stretching back to 2003, of some of our favourites over the years. 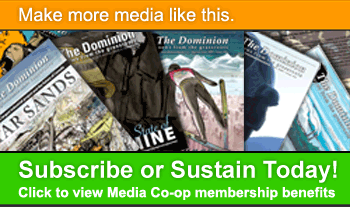 A huge thanks to all of our contributors, without whom The Dominion would have ceased to exist a long, long time ago. "Freedom of the Press Is for Those Who Own One" by Erin Steuter. 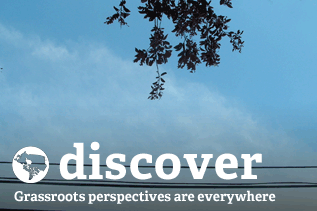 In New Brunswick, the Irving family owns nearly every English-language daily newspaper, controls several major industries, and directly employs one in eight New Brunswickers. 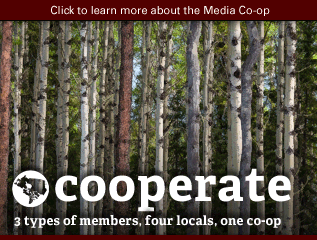 In "Freedom of the Press Is for Those Who Own One," Erin Steuter breaks down the impact of this concentration of ownership on political possibility and debate in the province. Though Canadian industry and media are controlled by slightly more than one family, Steuter's analysis remains a useful lens through which to understand the impact of the increasing power of media owners and the ways in which they wield their control. "Canada in Haiti: Who Engineered the Overthrow of Democracy?" by Anthony Fenton. In February 2004, the democratically elected President of Haiti was overthrown in a coup d'état. From the beginning, The Dominion was one of the only media outlets to provide coverage of the coup—and Canada's key role in it—and the coup's bloody aftermath. 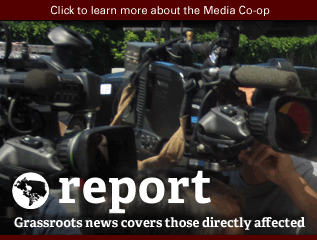 In this article, Anthony Fenton investigates the role Canada played in the disinformation campaign leading up to the coup. "I Can't Go Back to Iraq" by Benjamin Witte. US Army Specialist Darrell Anderson came to Canada in 2005 as a deserter from the US military after a seven-month tour in Iraq. “It's my human right to choose not to kill innocent people," said Anderson. "And there's no way I could go die for money and oil, rich people's investments. That's when I decided I couldn't go back." He told of being encouraged to open fire on youth and families at checkpoints. Like those of other deserters from the US military who arrived in Canada during the Iraq war, Anderson’s petition for refugee status was denied. He returned to the US in late 2007 and turned himself in to the US military. "Deport Injustice" by Sarah Rogers. After a series of historic migrant-rights demonstrations in the US and a wave of high-profile deportations in Toronto, non-status people and their allies took to the streets across the country in late May 2006 against Ottawa’s unjust immigration policies. Demonstrators called for “status for all undocumented workers and their families living in Canada and for the abolition of security certificates,” according to this report by Sarah Rogers. "What in Tar Nation?" by Maya Rolbin-Ghanie. The Dominion was the first news outlet in Canada to devote in-depth coverage to the largest industrial undertaking in human history. Writing while on a visit to Fort McMurray and Fort MacKay, Maya Rolbin-Ghanie speaks primarily with local, Indigenous people living on the front lines of this environmental catastrophe: Celina, an elder and trapper, and Billy, a Parks Canada firefighter in Fort Chipewyan, who both lament no longer being able to hunt and fish in the same manner, for fear of toxic contaminants from the oil fields. In an article that eschews corporate representatives or impersonal statistics, the voices of these two, and their concern for the future of their communities, ring clear. "Civilian Uprising against Barrick Gold in Tanzania" by Sakura Saunders. Most media coverage stopped at the sensational images of the destruction by villagers of $7 million in machinery at Canadian-owned Barrick Gold's mine, but Sakura Saunders's research revealed a story that was quickly becoming a pattern around Canadian-owned mining operations. The mid-December 2008 raid was sparked by the murder of a villager by Barrick security forces, but it was also a symptom of the mine's deeply negative impacts on the region and its people: forced displacement; loss of artisanal mining; murder by mine security forces of six others, including a child; destruction of local water sources; arrests of individuals opposing the mine's activities; and social division between locals who benefit from the mine and those who suffer its existence. "Did Canada Help Dismantle Sri Lanka’s Peace Process?" by Stu Neatby. 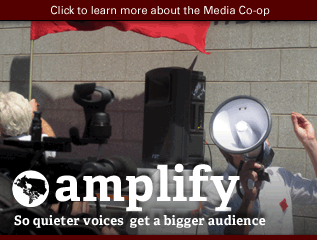 In April 2009, Stu Neatby broke the media silence on huge anti-war demonstrations by tens of thousands of members of the Tamil diaspora in Toronto. Among other actions, demonstrators formed a human chain around Union Station, bringing the city to a grinding halt in protest of Canada's support for violence perpetrated by the Sri Lankan government. Neatby reported that Canada backed the Sri Lankan government's campaign against the Tamil Tigers, regardless of the fact that thousands of civilians were killed in the violence in the first four months of 2009 alone. 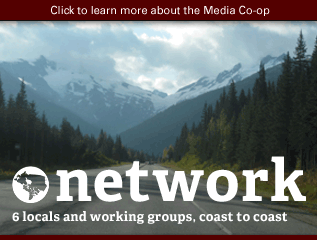 "The Canadian Boreal Forest Agreement Reconsidered" by Dawn Paley. This year, environmental NGOs celebrated the announcement of the Canadian Boreal Forest Agreement (CBFA) as an unprecedented initiative to protect key caribou habitat. 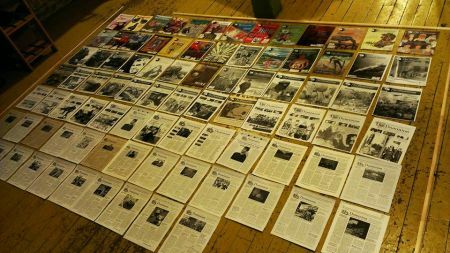 Dawn Paley's piece called the triumphant narrative into question, drawing on a copy of the document leaked to the Vancouver Media Co-op and a wide range of reactions, including Indigenous opposition and critiques of their exclusion from the process. 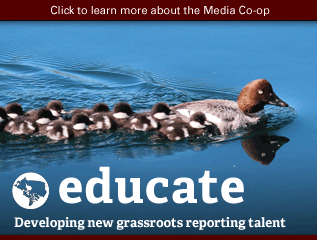 The Dominion and the Media Co-op continued to follow the story, with updates about damage control by NGOs later that year and Greenpeace's withdrawal in 2012. 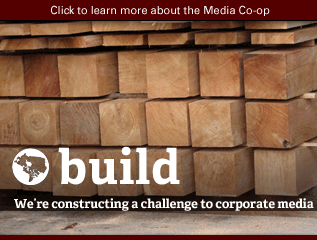 "Occupations Spread to Streets and Squares across Canada" by Media Co-op Contributors. 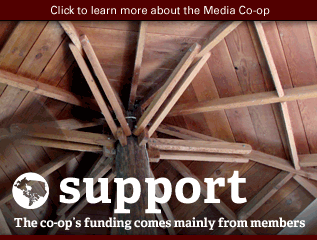 The Occupy movement, although in hindsight perhaps a flash in the pan, brought tens of thousands of activists together across Canada. The aims were massive—and the demands not necessarily forthcoming in media-friendly soundbites. Throughout the strike, The Dominion was there, doing its best to empathize with the rallying cry of a movement no longer satisfied to watch from the shadows while capitalism carves up what remains of the planet. "Red Square Roots" by Stefan Christoff. This was the year of the red square, as outlined in this story by Stefan Christoff. The Dominion ratcheted up coverage of the Quebec student strike like nobody's business. While mainstream media were content to dismiss the protests as irrelevant, or to report from time to time on the sensationalistic elements of the nightly clashes between protesters and the police, The Dominion provided insight, on-the-ground reporting, and even solution-based alternatives to the summer of the student strike.